Tofu, or bean curd, is a pretty amazing food. It is a plant based food, made from soybean. The process to get it to the beautiful and familiar block form that we see in our favorite supermarkets is something like the process of cheese making. Fresh soybean milk is curdling then pressed into blocks. 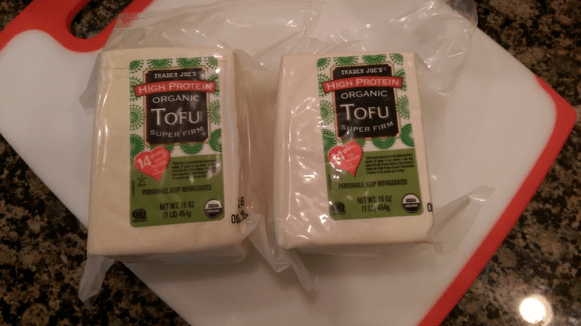 Tofu is a great source of protein, it is also rich in iron, calcium and is low in fat. To say it is the perfect food, to some that might be a stretch but it comes pretty darn close in my book. Bean Curd has a very mild taste on its own. When cooked, it absorbs the flavors that it prepared with. The adaptability of this protein in dishes and how well it marries with most spices has endless combinations. Tofu isn’t just for vegetarians anymore. Many people are using this protein source in a variety of dishes, including desserts. I have found a way to prepare it that my family likes, it is a simply baked in the oven with olive oil and spices. AROMA Italian seasoning to me is one the best flavors to bake with the tofu, it gives it a little zip to the dish. This is great just to snack on fresh out of the oven, or serve on a salad. The key to getting this tofu nice and crispy is to use extra firm kind. Once you start making this, it will become a favorite. 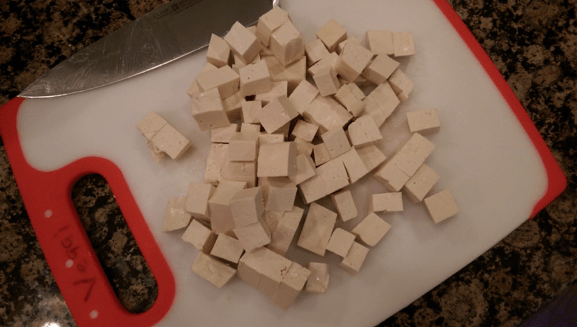 Cut the tofu into approximately about 1 inch cubes, no need to have precise measurements as you can tell. 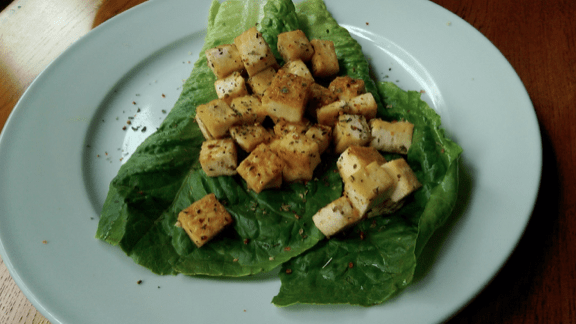 Sprinkle the tofu with Ciao Pittsburgh Aroma seasoning, salt, pepper and toss with extra virgin olive oil. Using really good olive oil is important, the richness of the oil will add an additional layer of flavor to the tofu. Lay the cubes on a lined baking sheet, be sure not to over crowd the tofu. Bake at 425 degrees for 20 minutes and until golden brown. The possibilities are endless are what to do with these AROMA cubes. Eating them straight from the oven are great or severed with a salad. No matter which way you eat it, these AROMA tofu cubes are delicious. 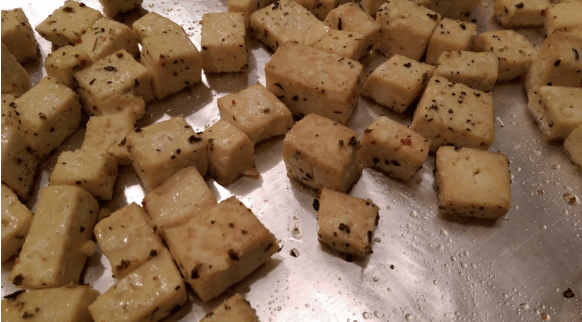 Drain excess water from tofu and cut into 1 inch cubes. 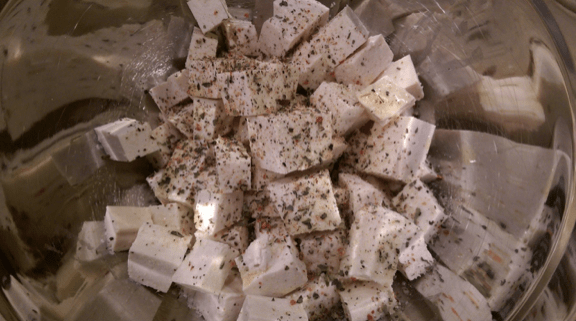 Place the tofu cubes into a mixing bowl and season with AROMA, salt and pepper. Carefully toss with the oil, being careful not to break the tofu cubes. 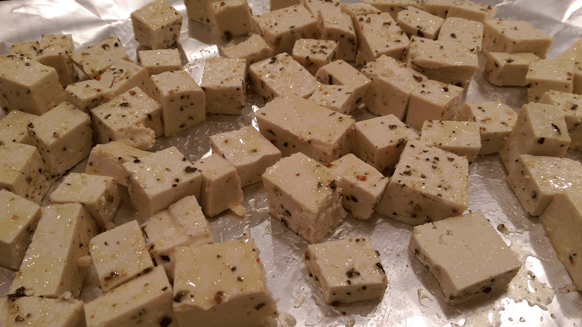 Make sure that there is enough of oil and spices to coat all of the pieces of tofu. Add the tofu to a lined baking sheet. Bake at 425 degrees for 20 minutes. The cubes will get golden brown and have a crispness to them when they are done. You can switch them to the lower rack of the oven for the last few minutes of baking to get the cubes extra crispy.